However, that assertion is not the case. While Tollefson, pointed to the continuous record of SCIAMACHY from 2002-2012 from the ESA Envisat and GOSAT's CO2 and CH4 data availability since 2009, and OCO-2's CO2 coverage since 2014, there were glaring omissions from the graphic and reporting he provided. First, the NASA Atmospheric Infrared Sounder (AIRS) instrument on the AQUA satellite has been providing CO2 global measurements since 2002 as well, with 2 ppm accuracy in the equatorial and mid latitudes. It has been a key tool in tracking CO2 for the last 14 years. Additionally, the METOP IASI CO2 and CH4 imagery availability was ignored. METOP 1-B and 2-A satellites provide global daily coverage for CO2 and CH4 atmospheric concentrations, and have done so since October, 2006 through their IASI instruments. They measure CO2 and CH4 in up to 100 atmospheric layers. EUMETSAT will launch METOP 3-C in 2018, if their effort stays on track. There is a need for more accurate and complete satellite data to complement the ESRL ground based collection sites to enable country based verification of emissions. An enhanced system will also enable more detailed analysis of natural source emissions and potential CO2 and CH4 increases. 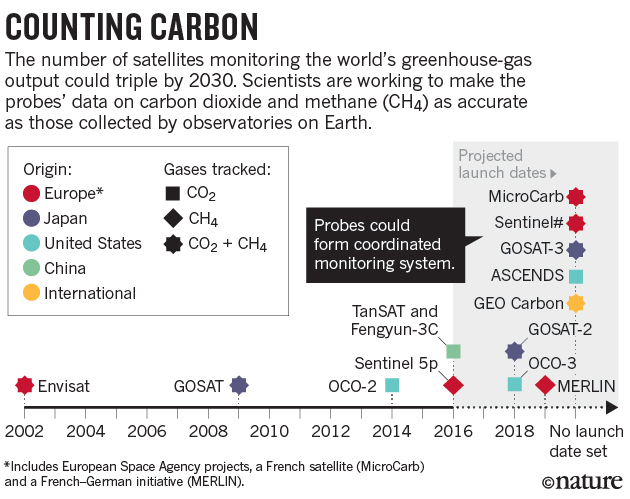 The point is, we have more sources of space based CO2 and CH4 tracking that implied, and more detail and coverage from the sources not mentioned in the article.